MEMORIAL CUP - The London Knights are through to Sunday's final at the MasterCard Memorial Cup. They improved to 3-0 in the round robin with a 5-2 win over Rouyn-Noranda on Tuesday night. The Knights are the best team at the tournament no doubt and beat their best competition in last nights game. Though it was tough to get a read because the refs and players got in the way to the tune of 17 powerplays between the two sides. The game was painful to watch at times because there was no flow and a ton of stoppages. Let the teams play! The Knights powerplay is just stupid good, there is no other way to put it. Mitch Marner, Christian Dvorak and Matthew Tkachuk are dynamite. 5 on 5 yes and with the man advantage they just play with the opposition. It's fun to watch, just not 20 times a game. Marner had 4 more assists last night and has 13 points in three games at the tournament... not to shabby. If the Oilers don't take London defenceman Olli Juolevi at number 4 in the NHL Draft I will be stunned. Really surprised at the Brandon Wheat Kings through their first two games of the tournament. Not only are they oh and two but they've been outscored 14-4 and have looked out of place against Rouyn-Noranda and especially the London Knights. Brandon has almost looked uninterested. I know that's not truly how the players feel but they aren't playing with any jump and discipline has been a huge problem. Fortunately for them all they need is a win tonight against Red Deer to keep their tournament alive but they will need to be much better. Red Deer beat Rouyn-Noranda and have looked pretty good through their first two games. If the Wheat Kings win tonight it would mean a three way tie for 2nd in the round robin standings at 1 and 2. Based on goals for and against one team would go straight to the semi-final and the other two would play in a tie-breaker. 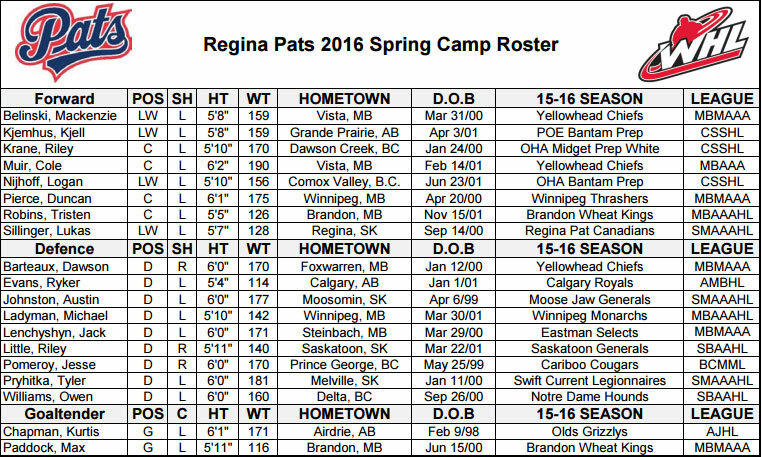 SPRING CAMP - The Regina Pats will welcome 19 of their prospects to the Co-Operators Centre this weekend, 17 skaters and 2 goaltenders. The players and their parents will get an orientation on Friday evening and then the kids will go through fitness testing. The first on-ice session will be Saturday at 10:30 AM and then again Sunday at 10:30 AM. Head Coach and GM John Paddock says it's an important weekend for both the players, their families and the organization. "We view it as an experience where they can meet us. A little bit of on ice stuff, a little bit of testing just to show the direction they need to go. They will tour the school and get a feel of where they could possibly be going to school at some point. So it's really just a fairly casual setting. It's really good for me probably more than anyone else and Dave (Struch) because most of the kids we don't get to see you know in their first draft and the last two drafts. So it's good in that way for us to get a visualization of them initially or how they may have changed over the last season." Paddock says they won't see American born players Bryan Lockner and Landon Langenbrunner this weekend. "Bryan is not going too and Landon was going too but his sister is graduating from high school this weekend so they are both out. Everything is fine with both of them. It doesn't change Bryan's approach, he will be coming to main camp and we hope to have him play with us next year." As for the 2016 WHL Bantam Draft, Paddock says all will be in attendance other than American defenceman Kaden Bohlsen. "It looks that way, Bohlsen we are still waiting for a phone call back from him but the rest will be here." PATS PROSPECTS AT U16'S - Seven of the eight players drafted by the Pats in 2016 are headed to or have already taken part in their respective provinces U16 development camps. Hockey Alberta was the latest provincial body to release its development camp list. 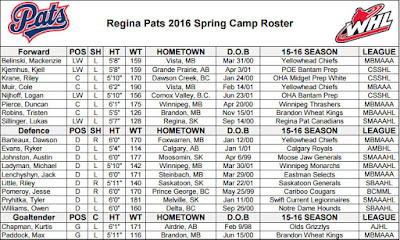 Both newly drafted, Alberta-born Pats prospects were among the 80 invited to the camp. Forward Kjell Kjemhus (4th round – 77th overall) and defenceman Ryker Evans (10th round – 209th overall). Alberta’s camp takes place July 5-10 in Camrose, AB. May 12-15 saw Hockey Manitoba hold it’s Program of Excellence Top-40 Camp. All three Pats Manitoban draftees were in attendance led by second round pick, forward Cole Muir (33rd overall). Joining him were forward Tristen Robins (4th round – 76th overall) and defenceman Michael Ladyman (5th round – 108th overall). Rounding out the Pats prospects attending Canadian summer camps is Logan Nijhoff (8th round – 165th overall). The forward will be in Shawnigan Lake, B.C. July 13-17 with 44 top players from British Columbia. Following these camps, each province will create a shortlist before trimming down to a final roster for the 2016 Western Canada U16 Challenge Cup in Calgary. Meanwhile, south of the border, forward Kaden Bohlsen (9th round – 187th overall) earned an invite to the USA Hockey Select-15 camp July 16-20 in Amherst, New York. HANLON IN VANCOUVER - The Vancouver Giants overhaul at the top has resulted in Glen Hanlon being hired as the teams second GM in it's history. Hanlon was Head Coach of the Washington Capitals from 2003-2007. He was also an Assistant Coach with the Vancouver Canucks, Head Coach of the Belarusian and Swiss national teams and an Assistant Coach with the Giants from 2011-2013. Before coaching Hanlon played in 477 NHL games with Vancouver, St. Louis, New York, and Detroit. Hanlon is now tasked with hiring a new Head Coach for the Giants and I'm told an announcement is coming very soon. Some reports have come out that former Kelowna Rockets coach Brad Ralph is among the final candidates. SUTTERS HONOURED BY WHL - The legendary Sutter brothers were honoured with the WHL Milestone Award at a reception Sunday evening as part of the MasterCard Memorial Cup festivities in Red Deer. The WHL Milestone Award pays tribute to extraordinary achievements by players, coaches, trainers, officials and teams over the 50 year history of the WHL. MALCOLM CAMERON HIRED IN ECHL - Former Regina Pats Head Coach and Assistant Coach Malcolm Cameron has landed back in the ECHL. The Wichita Thunder introduced Cameron as the 13th head coach in teams history last week. Cameron has spent the last two heads at the Okanagan Hockey Academy. NHL - The Pittsburgh Penguins forced game 7 in the Eastern Conference Final with a 5-2 over Tampa Bay last night. When the Pens went from Matt Murray, to Marc-Andre Fleury in goal and then back again for game 6 I thought they were dead. But Murray made 29 saves after getting game 5 off and now the Pens will head home for the deciding game of the series. We will see tonight if the same goaltending strategy works for St. Louis. They started Jake Allen in game 5 and lost 6-3 and will go back to Brian Elliott for game 6 tonight. I'm of the opinion you shouldn't change goaltenders in a series when you are tied 2-2 but obviously that didn't hurt Pittsburgh. I do believe however the Sharks are going to the cup finals. RAPTORS - I sit here today with my hand raised as one of the doubters of the Toronto Raptors in the Eastern Conference Final against Cleveland. Especially after games 1 and 2 when the Raps were embarrassed. However give Toronto all the credit in the world and more for the last two games they have played. Kyle Lowry and Demar DeRozan have showed up huge and Bizz Biyombo has been incredible in the middle. If the Cavs continue to love shooting the 3 ball 40 times a game then the Raptors will have a chance. Could you imagine if they pull off a road win in game 5 tonight and head home for game 6 with a chance to advance to the Finals? I am also blown away that the OKC Thunder are up 3-1 on Golden State in the West Finals. Sports are awesome. Well done Phil, good read. Paddock's nephew legit 5'11 116 lbs? I know 8 year olds that weigh more than that. No joke. Seriously... Tkachuk should be #2.